Where to begin? So much has happened since the last time I've written. Winter came on so fast. One day I was saying 'winter is coming.' Next day winter was here. Our biggest concern was shelters and thanks to Stevensville Troop #1991, were got our first shelter up. It is beautiful!. We continued the shelter momentum with an online fundraiser and thanks to you all, our generous supporters, we were able to raise enough funds to purchase the supplies for two more shelters.....Now getting them built is another issue. We have the materials ^ ready to build, but with just my mother in law and me caring for 45+ residents, me working full time, and going to school, well, it turns out finding the time to build has been tough. That said, You all made this possible and we take that very seriously. So, I am going to have a 'barn raising' day, and hopefully with help, we can get those shelters complete. Thank you again to everyone who made this possible. We will make this happen. On October 27, 2018 Lucent did not come to the gate for breakfast. Lucent was found abandoned by Animal Control. I was at the shelter to pick up another horse. When I saw Lucent I thought he was so majestic and beautiful. I told him I'd be back for him, and just about a week later I was. I called him our unicorn. Shortly after coming to TLERS he was diagnosed with wobblers and became a sanctuary resident. He wore many hats here at the rescue. He was Sheeza's best friend and when she was ready to foal, he was right by her side the whole time. He was the greatest babysitter to Lucas (Sheeza's colt) and Velvet and helped raise them into the horses they are today. He was always low in the herd and easy to get along with. He had difficulty keeping his weight so he would get supplemented senior feed. Everyday, twice a day, Lucent, along with the other hard keepers, came to the gate to be let out of the pasture for breakfast. I knew something was wrong when Lucent wasn't there. I found Lucent on the ground by a feeder. He was in obvious distress and I couldn't get him up. I gave him banamine, made the call to the vet, and was able to get him up and out of the pasture by the time the vet arrived. I knew it was bad. No gut sounds, elevated vitals, but the vet felt he had a chance, that he hadn't twisted his gut. So, we got Lucent onto the trailer and to the vet's office. Lucent was there all day the next day with little improvement and the following morning I received the call. Lucent had to be euthanized during the night. I am just so sorry he couldn't be home with his herd when the time came. I wish I could have been with him. I wish it didn't happen. He is so loved and greatly missed. 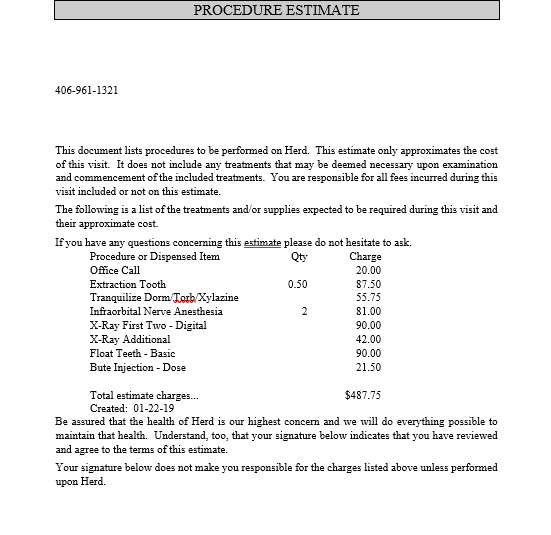 We have trouble getting our monthly costs covered. I am trying to think of ways to fundraise. We hope to have an online auction next month and maybe a Tshirt/sweatshirt sale as well. So, please stay tuned! 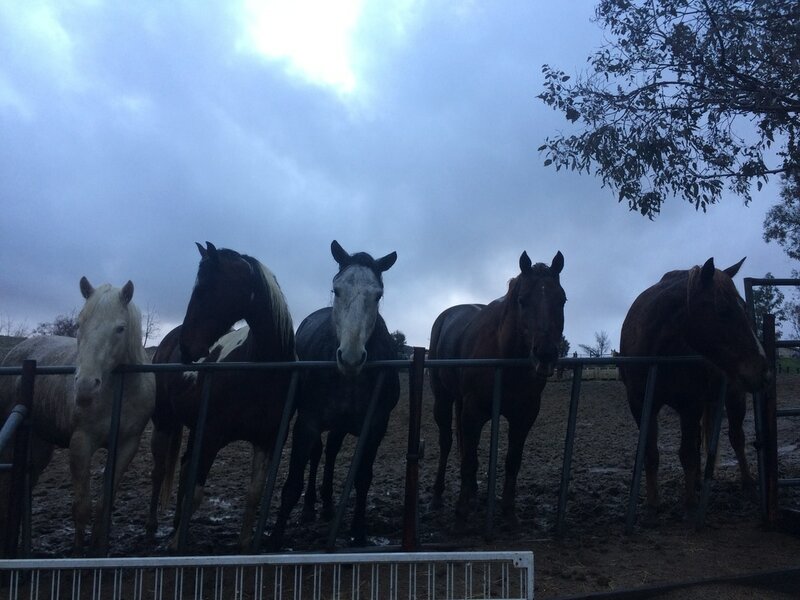 June 14th we received a message from our friend Beatrice Solorio about a horse in desperate need of help. Beatrice happened to drive by a pasture and see an emaciated paint gelding. She spoke with the owners who said he had dropped weight over the year but they couldn’t afford to have a vet see him. They agreed to relinquish him. We offered to fundraise for the costs, The Wings Program, Inc offered to take home in to rehab, and the ball started rolling. Thank you so much to our generous donors who made his rescue possible. He was picked up and taken straight to the vet. The pics and videos were too graphic to share. Named Winnie, he was a body score of 1. He had a large mass next to his right eye with an open hole next to it. It was filled with infection and maggots. The right side of his face was paralyzed making eating next to impossible. His right eye was sunken in. The vet cleaned him up, gave him pain meds, and we all decided to reevaluate in the morning. The morning brought no improvement. He hadn’t eaten or had a drink. He was lethargic and we made the decision to euthanize for quality of life. Winnie was walked to a willow tree and given a kind ending. It was the only gift we could offer, an end to his suffering. A necropsy was performed. Winnie had a large cancerous tumor that most likely started at the right eye. It extended up around the eardrum and down to the hyoid bone. The tumor had caused paralysis and his inability to eat was causing him to starve to death. This arrived as a complete surprise at Toby's Legacy. 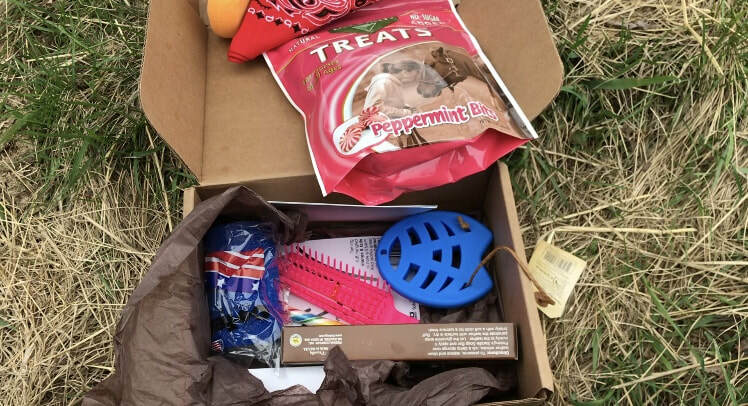 A box full of horse goodies and a $25 donation to the rescue. So many thanks to SaddleBox. 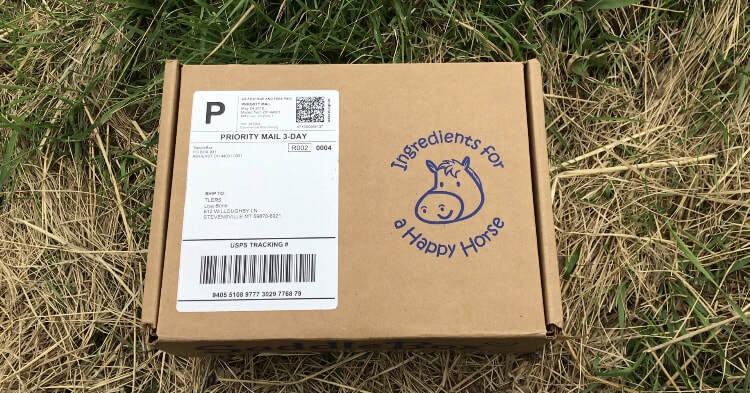 If you are looking for a wonderful gift for the horse-lover in your life, receiving this surprise box would light up anyone's day. The contents may vary but each item is thoughtful and useful. Really packed with goodies. Thank you again to SaddlelBox. Anyone would appreciate the gift as we did. Please be sure to click on the links above for more information about SaddleBox gifts. SADDLEBOX YOU ARE THE BEST! With the recent adoption of Corvinus and Tortuga into forever homes, we found ourselves at the Missoula Livestock Exchange horse sale. 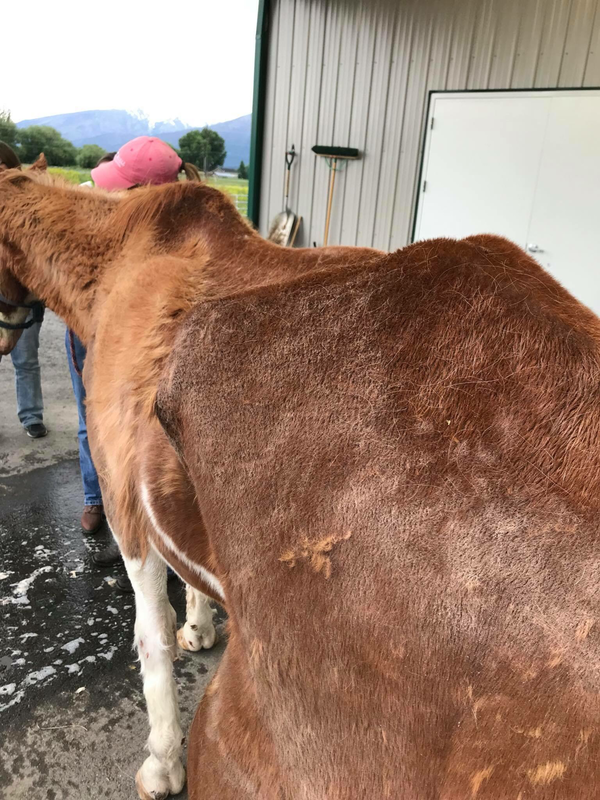 So many horses, all at risk, but we were drawn to a little emaciated redhead. She looked to be very old with no top teeth. She needed our help the most. We did a live feed throughout the sale and when a beautiful black mustang went through, a friend of ours commented on the feed asking us to bid. Unfortunately, a minute too late, and he sold to a kill buyer/horse trader. 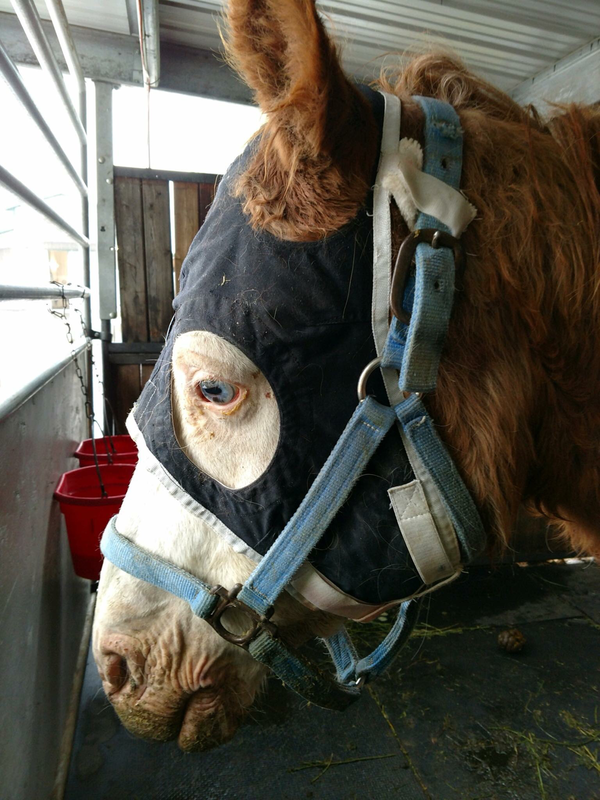 We were able to secure our elderly red mare's safety for $150 and negotiated the sale of the mustang for our friend, after the sale for just a $25 mark up. a The mustang, named Denny, quarantined at the rescue, and is now enjoying the good life in his forever home. Ginger successfully completed her rehab and quarantine and has joined the pasture. She is a bit of a loner but has been seen hanging out with Miss Adele. Word on the street is that this winter has been a mild one. As I write, the temp is probably hovering around the 50 degree mark....In February! I am more than thankful that Mother Nature has cut us a break and given the horses a relatively easy first winter to adjust to our new home. Speaking of new home, we have found our forever home for the rescue. Just a hop, skip, and jump from our current home in Corvallis, MT, this 21 acre ranch is located in Stevensville and checks all of our boxes. We can't wait until you see it and hope to be moved in by early March. We even have an open house in the works for Spring!!!! I think that's all of our new news! Talk to you soon! You're Face Hurts? Well, it's killing me! Lilac had some mild swelling on her face. Thinking nothing of it, maybe a tooth abscess, we contacted our vet, and she was started on antibiotics. Well, five days later and she had a watermelon head! So, our vet came out to do X-rays. Turns out, not an abscess, but a fractured cheekbone!. Didn't see that coming but she is a diva and an instigator. Not surprised. Glad she is okay, the swelling has gone down significantly, and she is on the mend.